Three UNPO Members (Tibet, Inner Mongolia and East Turkestan) united to commemorate the 2009 Urumqi massacre through a peaceful demonstration and to celebrate the anniversary of the Dalai Lama in an event with speeches and performances. On Thursday 5 July the East Turkestan Uyghur Association in the Netherlands organized a demonstration in The Hague to commemorate the July 2009 Urumqi massacre, in which hundreds of Uyghurs were killed by the Chinese police. 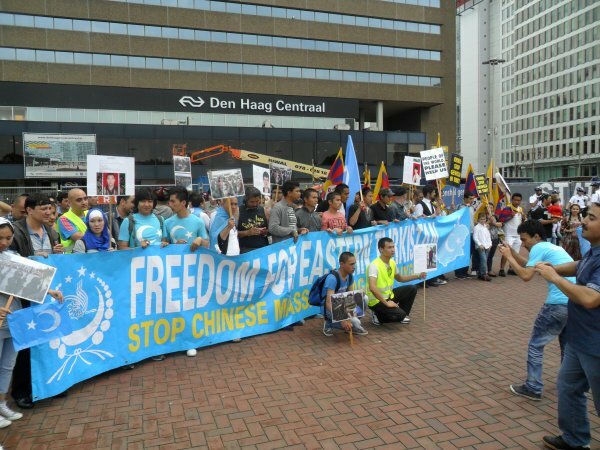 About 100 people gathered at The Hague central station, including Tibetans who also joined the event, as well as representatives from the International Campaign for Tibet and the Tibet Support Group the Netherlands. They started marching through the city towards the Chinese embassy. Many traditional outfits could be spotted in the crowd, while other protesters were waiving Tibetan and East Turkestan flags. To the sounds of ‘’What do we want? Freedom!’’, and “We want justice!’’ the protesters reached the embassy in a peaceful manner. The demonstration in front of the embassy lasted till 4 p.m. Speeches were delivered with a loudspeaker, mostly referring to the events of July 2009 in Urumqi as well as current human rights violations. On the following day, on Friday 6 July the International Campaign for Tibet organized a festive evening to celebrate the 77th birthday of the Dalai Lama at the Tropentheater in Amsterdam. Around 200 people attended this event and the program included several speakers from East Turkestan, Inner Mongolia and Tibet. At this occasion Mr. Ngodup Dongchung, the Minister of Security of the Tibetan government in exile, declared in his speech: "We are fighting for justice, the right to govern ourselves’’. Mr. Erkin Alptekin, former UNPO Secretary, former President of the World Uyghur Congress and Chairman of the Isa Alptekin Foundation added that: "Throughout history the Uyghurs, the Tibetans and the Mongolians have had close relationships [...] and today they are all facing the danger of losing their cultural identity". Mrs. Tsering Jampa, the Executive Director of the International Campaign for Tibet in the Netherlands stated that: "We are all here to make sure that Tibetans are not forgotten". The speeches were followed by the performances, the spectators were able to enjoy a traditional Tibetan dance as well as a music performance by a Uyghur renowned artist and other cultural displays. The event reaffirmed the unconditional solidarity between the people living under the oppression of China and was a call for political and cultural autonomy.